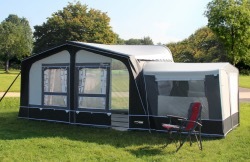 Walker's new universal awning the Maxi-300 is a more compact version of Walker's successful Maxi-380. 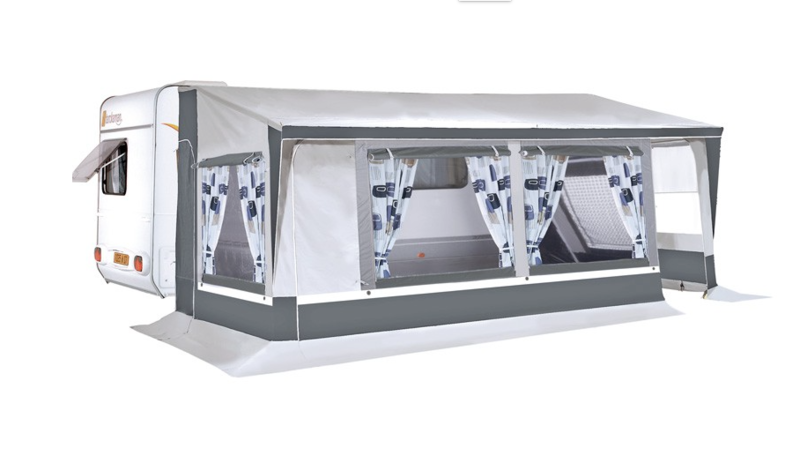 The Walker Maxi-300 is an ideal awning for Winter campers and also for campers who travel a lot. As caravans become bigger, not everyone wants an awning which takes up the whole side of the caravan. The Maxi is an ideal choice as it has a width of 310cm and a depth of 235cm. at floor level. There is an entrance door on both sides, and the front wall can be set up as a veranda. The sporty colours Anthracite + Champagne give this awning a modern contemporary look. The Maxi-300 has a steel frame as standard. 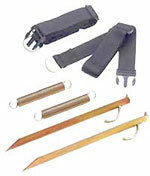 For Winter camping we recommend the "safety-set" of extra poles to carry the extra snow-load. If you plan to use it for touring, there is an option of 28mm aluminium frame with Easy-PowerGrips. Walker's new universal awning: Maxi-380 is an ideal awning for Winter campers and also for campers who travel a lot. As caravans become larger, not everyone wants an awning which takes up the whole side of the caravan. Maxi-380 is an ideal choice. The sporty colours anthracite + champagne give this awning a modern contemporary look. Snow and Fun Plus is Walker's porch for the Winter Sports enthusiasts. The floor measures 240 cm wide by 180 cm deep, providing welcome extra living space and the convenience of an entrance on both sides. 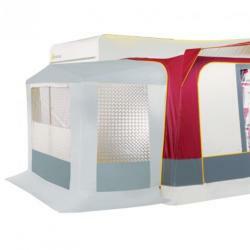 There are special vents under the roof that can be closed from the outside with a zipped panel. Snow & Fun Plus is supplied with a steel frame and weighs 23 kg. The middle section of the front is 300 cm deep! The 3 front panels can be zipped out as well as both side panels. Each side panel has a mesh ventilation window. Both sides of the roof include a special vent that can be closed from the outside.